We are dedicated to saving lives by providing training. Adult cardio pulmonary resuscitation training in Sri Lanka has been almost exclusively carried out by the college of Anaesthesiologists of Sri Lanka. The college of Anaesthesiologists & Intensivists of Sri Lanka has signed a course collaboration agreement with the European Resuscitation Council ( ERC) to conduct agreed Life Support courses in Sri Lanka. Immediate Life Support (ILS) provider course. Basic and advanced life support knowledge and skills deteriorate in as little as three to six months. The use of frequent assessments will identify those individuals who require refresher training to help maintain their knowledge and skills. Studies of advanced life support in actual or simulated in-hospital arrests, show improved resuscitation team performance when speciﬁc team and, or leadership training is added to advanced level courses. An increased emphasis on non-technical skills (NTS) such as leadership, teamwork, task management and structured communication will help improve the performance of CPR and patient care. Team training and rhythm recognition skills will be essential to minimize hands-off time when using the 2010 manual deﬁbrillation strategy that includes charging during chest compressions. Team briefings to plan for resuscitation attempts, and debriefings based on performance during simulated or actual resuscitation attempts should be used to help improve resuscitation team and individual performance. in 2017 we have trained about 1200 Preintern doctors in 6 Centers Island wide (Colombo, Galle, Kandy & Jaffna, Anuradhapura & Batticaloa ) . We have already trained about 4600 pre-intern doctors. CPR course E-manual was sent to all the participants well in advance. Same course program, lecture material, skill assessment were used in all centers. Online web based feedback was introduced. 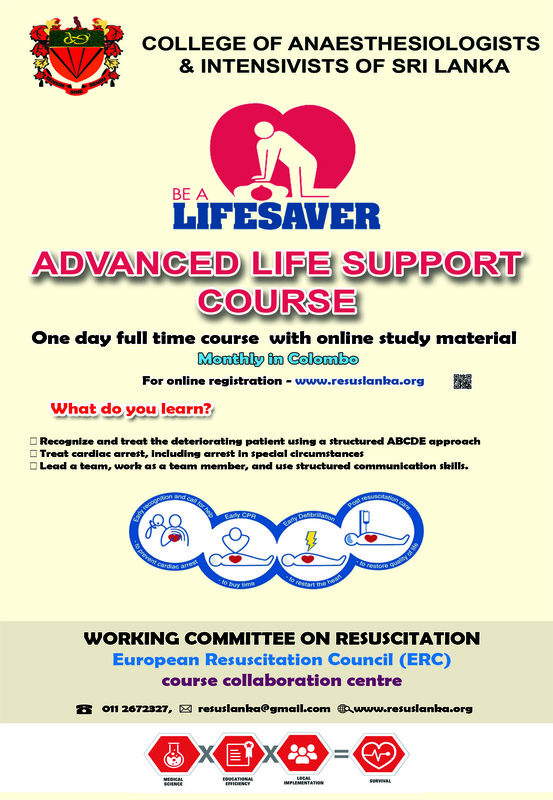 CPR Courses are supervised by the European Resuscitation Council (ERC) ALS instructors. One day CPR certification course for the medical graduates awaiting internship appointment with the Ministry of Health in –June 2018 is being organized by the College of Anaesthesiologists & Intensivists of Sri Lanka in collaboration with the Ministry of Health. This is the 7th consecutive year that the college of Anaesthesiologists & Intensivists organizes CPR training for Pre-intern doctors. LEARN A SKILL , SAVE A LIFE ! 09:00-09:45 Who are at risk of having Cardiac arrest? For free online registration . CPR teaching program was first started in 1993 at the accident service- General Hospital –Colombo by the college of Anaesthesiologists of Sri Lanka. Since then adult cardio pulmonary resuscitation training in Sri Lanka has been almost exclusively carried out by the college of Anaesthesiologists of Sri Lanka, training thousands of health care providers in resuscitation techniques. Inclusion of CPR teaching to post graduate training. CPR teaching at Accident Service –NHSL was converted to CPR certification course in 2007. The CPR workshop is held every Tuesday in the Trauma Lecture Theatre of the Accident Service, NHSL, Colombo. Certification is granted after a MCQ paper and a practical examination. More than 75% should be scored at the MCQ examination for a candidate to proceed to the practical examination. Above committee was renamed as working committee on resuscitation on 30th May 2014. CPR certification for pre-intern doctors with the collaboration of the Ministry of Health Sri Lanka– started in 2012 September – Trained about 875 in 2012 & 1050 in 2013. Emergency first aid & basic life support-Community based training – Nalanda College , Colombo 10 – on May 2013& 11 July 2014. The college of Anaesthesiologists of Sri Lanka have signed a course collaboration agreement with the European Resuscitation Council ( ERC) to conduct agreed Advanced Life Support provider courses & Generic Instructor Courses (GIC) in Sri Lanka in July 2013. European Resuscitation Council -ERC courses. Following courses were successfully conducted with the participation of ERC instructors. We have conducted 8 One day Immediate Life Support (ILS) course in 2014 -Trained about 180 doctors & 20 Nurses in 2014 .ILS course manual with pre course MCQ were sent to participants at least 3 weeks prior to the course. Those who performed well in ILS course were selected as candidates with instructor potential. One day advanced life support course with online study material is now open for registration.